Pure to deliver music or radio apps throughout the home with Jongo wireless system | What Hi-Fi? Pure has announced that its Jongo wireless stereo and multi-room music system can now be used with any music streaming service - such as Deezer, Rdio and Spotify. The expansion of the Pure Connect platform - revealed today at CES 2014 in Las Vegas, US - will let you stream any audio or radio app to multiple Jongo speakers throughout the home. Caskeid technology is being rolled out by Pure to deliver audio content to the Jongo speakers using a combination of Bluetooth and wi-fi. The speakers and sessions are set up using the free Pure Connect App (iOS and Android). Once a music or radio service app has been chosen, content is sent via Bluetooth to a single speaker in a group. The Caskeid technology will then seamlessly send the audio to all speakers in the group. Pure will also be releasing a Caskeid App Developer Kit during Q1 2014 to ensure the Jongo wireless system's advanced capabilities are made fully accessible to music services. • In addition to rolling out Caskeid technology, Pure has unveiled its latest colour accessories for the Jongo wireless system - based on global trends for 2014. 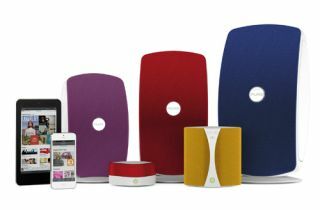 Two new colour collections that allow customers to accessorise their speakers are Neutral - featuring Goblin Blue, Comfrey, Iron and Travertine - and Vibrant, which comprises Dazzling Blue, Radiant Orchid, Mango and Cayenne. The new speaker grilles will be available to buy from the end of January, starting from £12.99 from all leading electronic retailers and Pure.com.